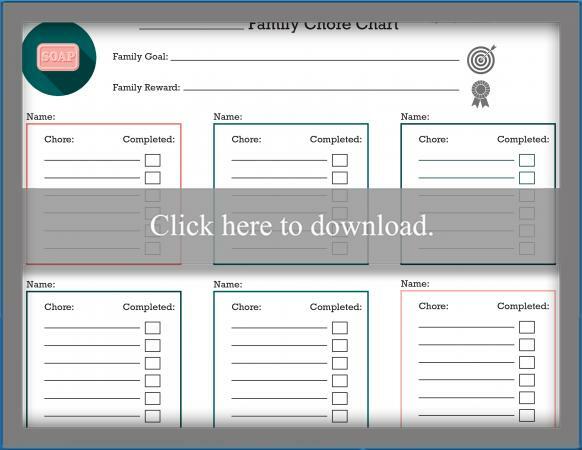 Family chore charts are great teaching tools to help your kids learn responsibility. Even children as young as preschoolers can benefit from a chore chart. These chore chart examples are very easy to personalize and incorporate into fun activities that accomplish useful tasks. 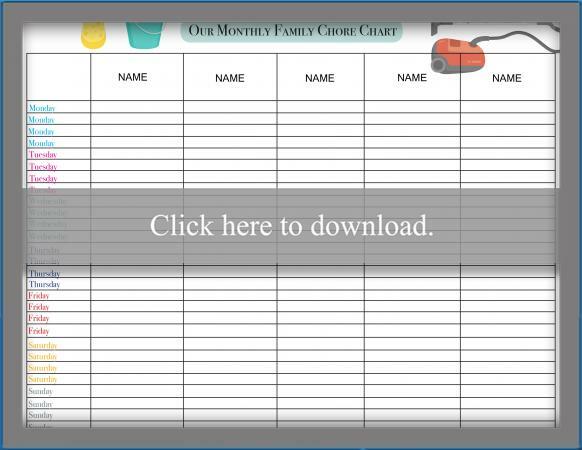 If you are a high-tech family or simply want to get the chore chart started ASAP, a printable family chore chart is perfect for you. Click on the image of the chart that suits your family then customize, download, and print. Use the Adobe Guide for tips and troubleshooting. Each family member has their own chore list to complete on this chart. Although chores are separated by person, everyone's list is shown on one page so you can also see the bigger picture. Separating the chore chart by person helps young children see their own tasks and shows teens that everyone is doing their fair share. Set a family goal such as each person completes half of their chores by Friday and offer a reward for the whole group. If you've got a large family, simply print several copies of the chart and hang them side-by-side. Plan ahead for the entire month with a monthly family chore chart. Each family member gets their own section to write in what chores they completed each day of the week for an entire month. You can fill in assigned chores and have younger children cross them out when completed or leave them open and let older kids and teens write in their accomplishments. If you've got older kids and teens or want to reinforce self-motivation and independence, try this checklist-style family chore chart. Tasks are listed on the left and each person must check off which day of the week they completed a specific chore. On the second page of the chart there is room to set individual goals for each family member and track their progress. A blank chore chart is set up like a blank monthly calendar with a column for inserting specific chores. 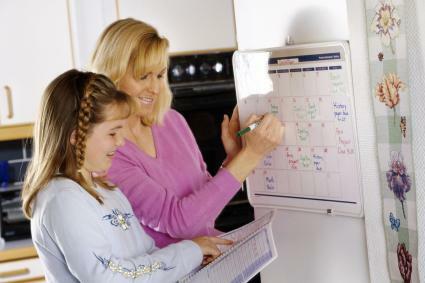 Use a weekly family chore chart that includes a list of chores you can check off each day of the week. 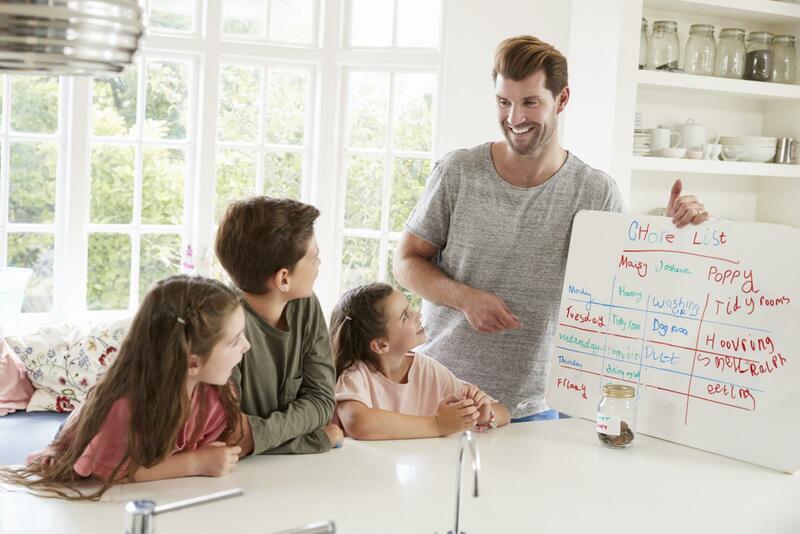 Start with a children's chore chart if your kids are all under age 5 and complete each task pictured together as a family. Making your own chore chart is the best way to ensure that a chart suits your family's unique needs. You can make an online chart, a paper chart, or a crafty version from a bulletin board, chalkboard, or dry erase board. Choose the method that your family can help create and works with your collective lifestyles. Every family chore chart is unique to the family who owns it. However, for your chart to be effective it should include these basic elements. Goals - Figure out the types of chores you hope to accomplish as a family or on an individual basis. Rewards - What will each person or the whole family earn for meeting their goals? Chore Assignments - Assign specific tasks to each family member based on age. Chore List - If you choose an open format, include a list of chores that members can choose from throughout the week. You can use a spreadsheet creation tool like Microsoft Excel or Google Sheets to make an online family chore chart. Allow access to all family members so they can get into the document and update it as chores are completed or print and hang it. Think of the spreadsheet like a table. Choose a format you like from a chore chart template then recreate it by adding headings across the top and border lines around cells or sections. You can even add colors to further sort your categories or add visual interest. 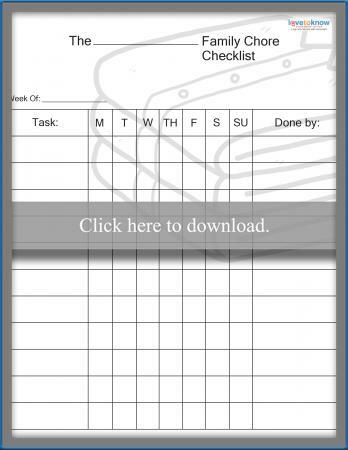 You can purchase a variety of chore chart apps or you can create a simple chore chart using your Google Calendar App. Start by creating a shared family calendar in your Google account. Assign each family member a color and make sure they all have access to the calendar. Each person can add reminders to do certain chores, goals to do chores on a scheduled basis, or events that show when they completed a task. This type of chore chart is best for families with tweens and teens. If you're a crafty family, grab some supplies and start creating your own custom DIY chore chart. Turn a large chalkboard into a chore chart by creating a table then using a different color chalk for each person's tasks. Erase chores when they are done. Start with a standard desk calendar then use different colored pens or markers to assign chores on a monthly basis. Add goals, rewards, and chore lists in the "notes" section. Create a table on a large metal pan, magnet board, or magnetic space like the front of a dishwasher or fridge with decorative tape. Make your own magnets with either names of chores or names of family members. Once you have a chore chart, you need to learn to use it effectively as it is only effective when family members want to participate. Create the chore chart together as a family so everyone gets a say. Assign age-appropriate tasks to keep things fair and avoid frustration from impossible tasks. Make it fun by incorporating chores into games or timed competitions. Add incentives for individual family members and the whole group. Use stickers or specific marks to show progress toward the goal. Keep the chart in a common area where everyone can access it at any time. Set ground rules about how tasks can be marked complete like requiring one other family member to check and confirm a completed chore. Model desired behaviors by making the chart a priority for the parents too. Schedule a check-in time at the end of each week to go over what's been done and what's left. Adjust the chart on a regular basis to account for major schedule changes. Standard household chores include dusting, washing dishes, cleaning floors, and doing laundry. Consider chores by age like chores for teens that might include mowing the lawn or watching a sibling after school. Break down the tasks by area of the house such as kitchen tasks like cleaning out the fridge or mopping the floor. Include external cleaning chores if they apply to the current season. Factor in deep cleaning tasks periodically like washing the curtains or wiping down ceiling fans. Charts are a versatile tool that can be incorporated in family activities or educational lessons for all ages. When you incorporate a chart into an enjoyable family activity, even the adult family members will want to get the chore completed so they can move onto the fun activity. If your family needs a little encouragement to help out around the house, a family chore chart may be the answer.